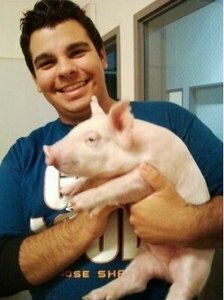 I am a third year Animal Science major emphasizing in Livestock and Dairy from San Jose. I am currently Pre-Vet and hope to attend vet school to become a Food Animal Vet. I live at the on-campus feedlot working as a student resident for the beef unit operations. Also, I am the current President of Aggie Ambassadors, the student outreach organization within the College of Agricultural & Environmental Sciences. Educated the public about the benefits and processes of animal agriculture in America at various venues throughout the United States. From California to Minnesota, I have spoke to over 1,500 people about how livestock are raised. I live at the feedlot and am responsible for general animal care of the beef unit operations at the university, in addition to daily feedings and helping as a teaching assistant to other students learning at the beef facilities.